Adults do it different. Sylvia was quite happy with Dolly's apron. Even proud of her work. I felt guilty because I had been promising to make an apron. I have mentioned before that I am not keen on sewing. 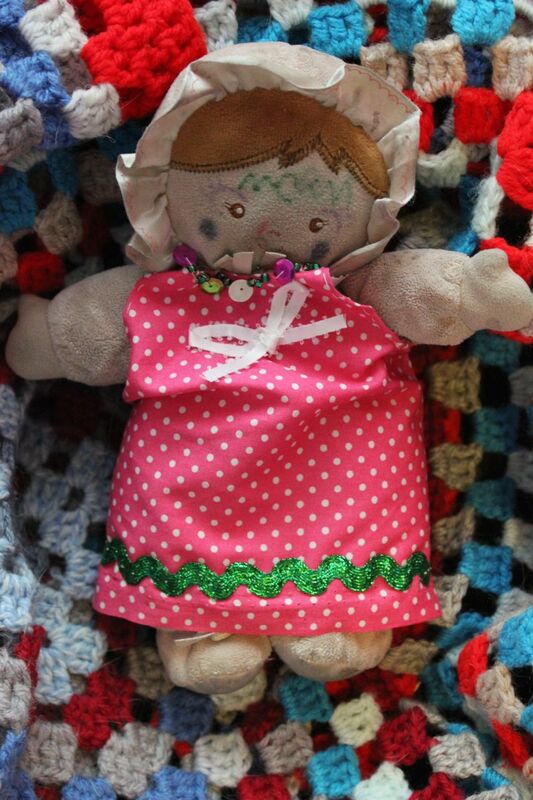 So you will understand that this little dress I have finally hand-sewn for Dolly (below) is a labour of love. Sylvia was happy with the dress. We even have some material to make more dresses. Meanwhile, we have undertaken some other little projects that would never sell in a shop but delight Sylvia. Below is a bunkbed that E and Sylvia made out of rulers, gaffer tape and lids off boxes that hold printing paper. Another little project is a swing that Sylvia was determined to make. We started with an old shoebox and painted it. Then we found twigs in the garden and stuck them together with masking tape and hung the swing with wool. Did it work? No. We spent more time trying to stand up the swing than swinging it. But Sylvia loved it. 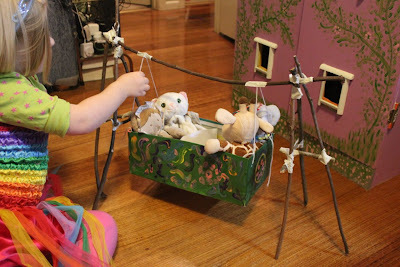 After we gave up on the twig stand, we hung the shoebox swing between two of her kiddie chairs and she loved that too. 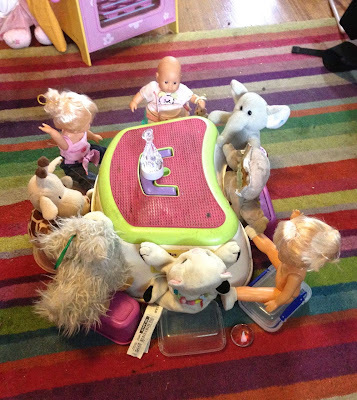 Most recently, she has created a dollies party with her dolls (etc) seated on plastic tubs from the kitchen around a little stool she has. Children can make so much out of so little. Enough about making children's toys from very little. One of the easiest ways to entertain a child is to bake. 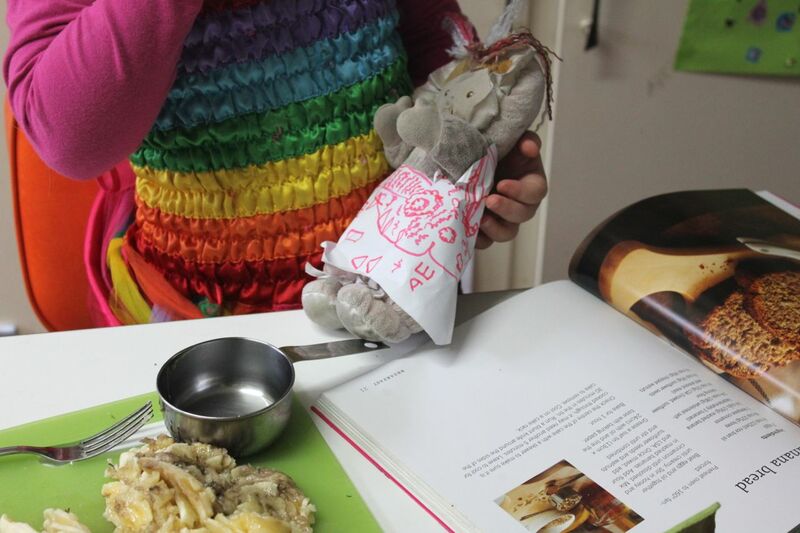 Sylvia (and Dolly) are always happy to tip ingredients into a bowl and stir them, if with perhaps a tad too much vigour. This banana bread had the right balance for me. It was not so far from the traditional banana cake that I grew up with. Yet it was more substantial and healthy with lots of seeds, nuts, honey and treacle. Actually the original recipe didn't have treacle. I made it and never posted it because it just didn't come out right. I used a silicone cake 'tin' that wasn't as non-stick as it once was and the cake was just a bit sticky inside. E said he would love a banana bread with treacle. At first I considered adding quite a lot of treacle which seemed to make it more gingerbread than banana bread. In the end I decided that a little treacle (instead of honey) would be enough to make an impact. It was darker than the first iteration and so much better for staying in the oven a little longer. We all loved this cake. Sylvia was a little wary of the bits. Next time I must remember to finely chop the walnuts. E wanted it with ice cream. I loved it spread with chocolate spread. However I think it is brilliant without any accompaniments. The flavours are complex with honey, treacle and cinnamon and the texture is interesting. In fact it tastes so good and healthy that I would like to make this my regular banana cake. Beat together eggs and rice bran oil (electric beaters optional). Mix in honey and treacle by hand. Stir in banana and then gently stir in remaining ingredients. Tip into a greased and lined loaf tin. Bake at 180 C for 1 hour (I baked mine at 190 C for about 10 minutes longer because the first time even at 190 C for an hour it was a bit moist inside.) Leave in tin about 10 minutes and then turn out onto a wire rack. Keeps in an airtight container at least 3 days. This banana cake looks delicious, and I would love the "bits". I enjoyed reading about and seeing Sylvia's imaginative play items - oh to be so readily entertained as an adult. I've never tasted banana bread with treacle. Interesting. But I love that you have honey and almond meal in this recipe. Also interesting. Thank you so much for sharing and Congrats! It's a Boy! 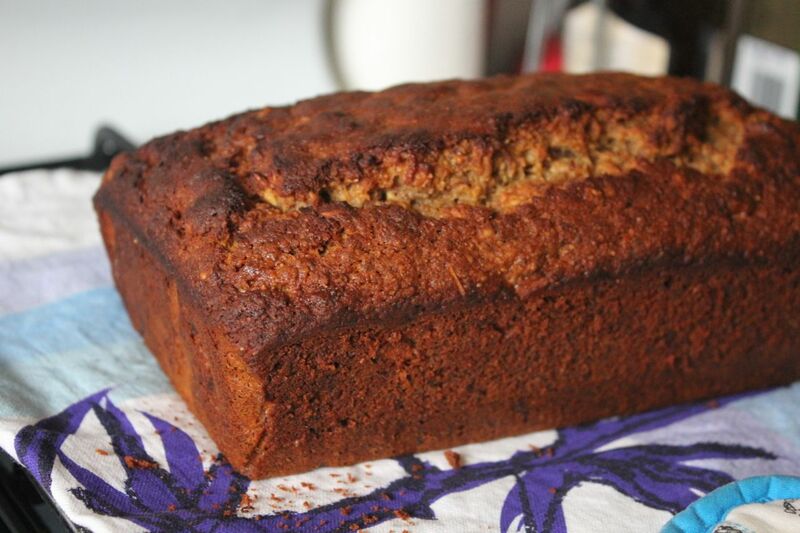 This looks like my sort of banana bread - I like bits and I like treacle. I also love Sylvia's creations and the various doll accompaniments. You might not sell them in a shop but I think they are much better than anything you could find in a shop! Thanks Kari - I love bits and treacle too - at least Sylvia loves treacle. I love all the little toys in the shops that create little worlds for kids but there is nothing like making it yourself. What a lovely banana bread! And it really is amazing how little kids need to really be content! This is COMPLETELY my kind of banana bread. And I miss those days of making crafts that seemed magical. 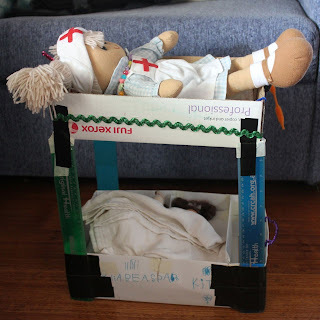 That was so lovely to see the projects you have with your children! And yes, when you let them. children will make a lot out of very little! My favorite things as a child was drawing, and my mom sometimes spent time drawing with me, which made me very happy. I also like to build castles from paper which I cut and then put together. Is banana bread something traditional like ginger bread? I know the latter, but banana bread is nothing we have over here. 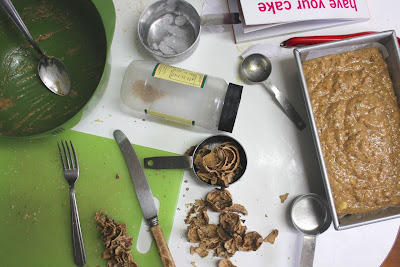 Still, it seems to be one of the favorite things to make in the food blog world. I used to think that was because you can use bananas to substitute regular sugar so it's healthier than simple sweet bread. Thanks Kath - Sylvia loves drawing castles - I think both of us would love to build castles out of paper but I suspect Sylvia would be better at it than me because I would try to do too much whereas she is happy with simple ideas. 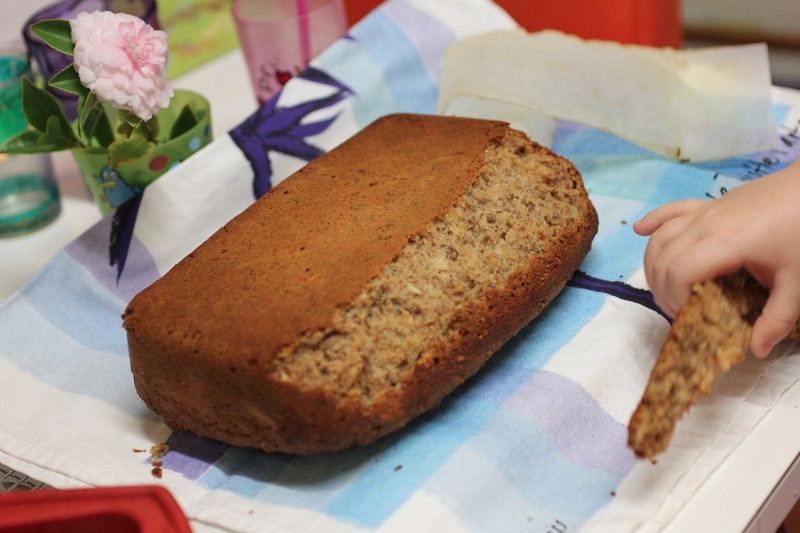 Banana bread is probably as common as gingerbread loaves - it is something my mum made me a lot when I was little (though it was actually banana cake - I get a little confused about the distinction between banana bread and banana cake - I guess the bread is more dense). 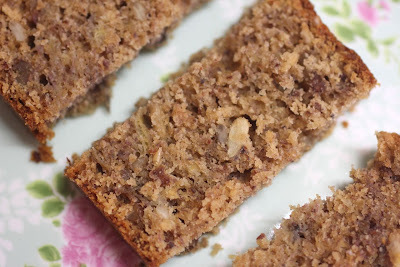 I guess a lot of people make banana bread a lot for the same reason I do - bananas go soft so quickly and make such great cakes and yes less sugar is needed with bananas. 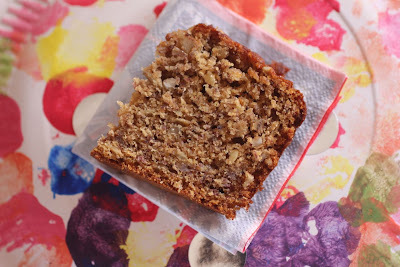 I absolutely love banana bread and your healthy version sounds fantastic! Thank you for sharing with the No Waste Food Challenge!